The XO is bonded to the case then a #6 should be connected to a ground rod or grid correct? Even if temporary correct? Please see photo..if possible point me to the NEC article. Transformer with #6 not connected to anything...NEC article? This should be grounded to a ground rod even if temporary. This is from the '08 Handbook. 250.30 Grounding Separately Derived Alternating-Current Systems. (A) Grounded Systems. A separately derived ac system that is grounded shall comply with 250.30(A)(1) through (A)(8). Except as otherwise permitted in this article, a grounded conductor shall not be connected to normally non�current-carrying metal parts of equipment, to equipment grounding conductors, or be reconnected to ground on the load side of the point of grounding of a separately derived system. FPN: See 250.32 for connections at separate buildings or structures, and 250.142 for use of the grounded circuit conductor for grounding equipment. Exception: Impedance grounded neutral system grounding connections shall be made as specified in 250.36 or 250.186. Thanks for the reply HotLine1...so are you saying that the XO bonding to case and then to ground is not allowed? Is this the exception you are talking about ? Exception: A grounding electrode conductor is not required for a system that supplies a Class 1 circuit from a transformer rated not more than 1000 volt-amperes. However, the system grounded conductor must be bonded to the transformer frame or enclosure in accordance with 250.30(A)(1). Let me say this in easy form. The transformer XO (Neutral or grounded conductor) is one point that the GEC can be terminated at. This is also the point that the bond for the transformer enclosure is bonded to, usually with a factory ground strap. A compliant field installed bond is also acceptable. The GEC from the transformer can be terminated at the building steel, metalic water piping, ground ring, rod(s), etc. Article 250 can be one of the tougher to get a grip on. Thanks Hotline...so if the transformer has a factory installed BONDING Strap attached to the case from the same point that the xo IS BONDED TO THE CASE then NO ground rod or other GEC is required? You are correct article 250 is tricky and one of the most important sections in my opinion. 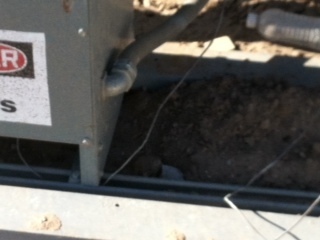 No, the bond strap or field installed compliant conductor ONLY bonds the enclosure! OK! Great thank you very much for the help! That article is confusing. Your first assumption was right. You hook your GEC to the XO and that is also where the can usually gets bonded. All of that other language is just saying you have a ground and neutral radiating from that point that never meet again. You should submit the above words to NFPA.